I spent last night at Maggie's helping her wrap gifts for her family in Cape Cod, but mostly just drinking rum toddies and telling stories. 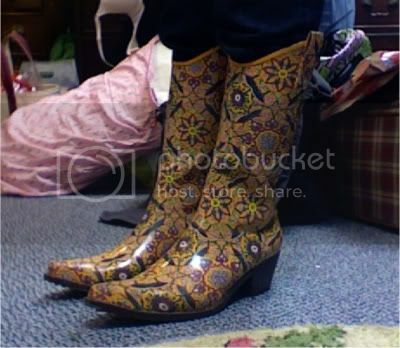 She and her mom gave my half of my gifts, and I ended up with the coolest pair of rain boots of all time (see below). And an Indiana Jones calendar, because I talk about Harrison Ford quite a bit around the two of them. He is one of my only loves. But the real gift was spending time together, as corny as it sounds. I drove Maggie to Port Authority this morning so she could hop a bus to Boston, where she'll meet up with her dad. It felt weird, standing in the interminable line to keep her company. It was the first time I had ever driven into New York on my own, but that wasn't it really. I just felt more like an adult than I ever have, giving my friend a ride to the bus station. I have to think about it some more to completely process the situation. Maybe I was just out of it. I'm going to use that excuse for not knowing what side of my sister's car contains the gas tank, and getting onto Rt. 1 & 9 instead of the turnpike after I got out of the Lincoln Tunnel. I need a nap. Tonight is midnight mass (against my will) and then late night diner with my dad, a new tradition started last Christmas eve. Right now we're trimming the tree, which is fun mostly because I get to look at all the ornaments I made in elementary school that have my picture on them. My current haircut is eerily similar to the one I had in sixth grade.